Ok, firstly, what is UP with all the amazing debuts? These authors make writing look easy and I find myself getting whiplash from every time I do a double take at the mention that an amazing book I just read is a debut effort! Well guess what, friends? 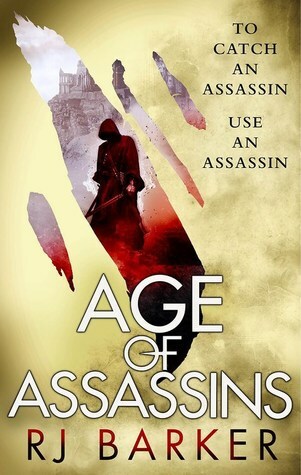 Enter Age of Assassins, ANOTHER fantastic debut that is worth your time. The very short version of what this book is about is perfectly summarized in the tag line on the book’s cover – To catch an assassin, use an assassin! The longer version is that two assassins, namely Merela Karn, arguably the greatest living assassin, and her apprentice, Girton Clubfoot, are lured into a trap and ultimately blackmailed into taking on an unusual job. Instead of assassinating someone, they are tasked with determining whether or not there is a conspiracy to assassinate the royal heir and if so, to prevent it from happening. This leads to Merela & Girton both taking on false identities ( A jester & a squire) and entrenching themselves in the day to day living of the castle and it’s occupants in order to investigate this possible killer. So there you have it. An action packed murder mystery assassin fantasy! If you just sent this straight to your TBR, well done! You have chosen…wisely. Following the trials and tribulations of a 15 year old assassin who is very good at what he does, and yet has almost no exposure whatsoever to being normal or a kid or even to interacting with people of the same age whilst still having to find a possible assassin in a castle fraught with tension makes for very, very good reading. Girton is thrust into a world that he has no experience of, and it is compelling to see how he navigates this strange new world with the only skills he has on hand, and the invaluable support of his master, Merela. First iteration: the Precise Steps. Forward into the range of his weapons. He thrust with his stabsword. Ninth iteration: the Bow.Middle of my body bowing backwards to avoid the blade. With his other hand he swung his club at my head. I ducked. As his arm came over my head I grabbed his elbow and pushed, making him lose his balance, and as he struggled to right himself I found purchase on the rim of his chest piece. Tenth iteration: the Broom. Sweeping my leg round I knocked his feet from under him. With a push I sent him flailing into the hole so he cracked his head on the edge of it on his way down. Last, but not least, the murder mystery is top notch and extremely well done. Clues are littered throughout, characters will have you questioning their motives and everything is woven together with a deft touch to make for an exciting finish. While wrapping up almost all the threads, Mr Barker does leave one or two open for the rest of the trilogy. The story works perfectly as a stand alone though, so do not delay in experiencing it for the sake of a completed trilogy, but rather, go out and get this book NOW. Age of Assassins has continued the trend of stunning debuts for 2017 and made sure that RJ Barker is an author to take note of. Highly recommended. Great review. Sounds like a nice change from books in trilogies that leave you hanging for the next novel. Thanks 😀 Yes, the author got the balance down perfectly. Fantastic review and I totally agree, what’s up with all the debuts?!? It’s fantastic for all of us who are fantasy fans but damn, 2017 really is the year for great debuts! Yes, what a year! We are lucky readers!